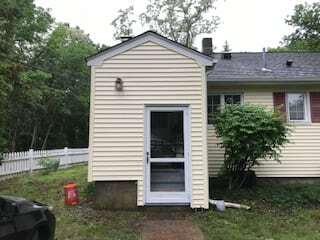 Take a look at the before and after shot of the pressure washing job we completed in Somersworth NH. Our clients have different needs, and we are here to meet them all. It is a satisfying feeling when you are finished a project like this one. There is such a large difference between the before and after shots. It will make your surfaces look like new again! Finding the right pressure washing tools is a tough task, but finding the right company to handle your needs is easy. We are the professionals in home rehab, including pressure washing! We find that most of our clients are scrubbing surfaces for hours with little results, and purchasing equipment that does not do the job. We are here to make your lives just a little bit easier. Call us today! We are here to handle the messy tasks so you can sit back and relax. We’re a fairly priced home rehab and home repair company who is aching to assist the Seacoast area homeowners. Give us a call today or even shoot us a message below.